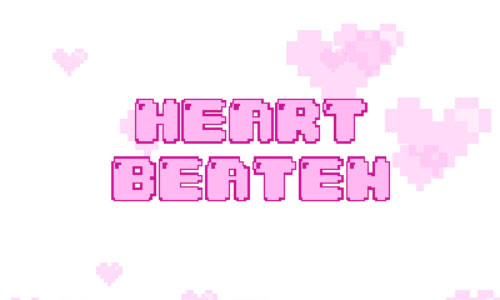 Originally created and developed during the Global Game Jam of 2013 in a little over 24 hours, Heart Beaten has been available on Android and iOS platforms for a couple of years. The newly released Nintendo 3DS version expands on the mobile version with structural changes, brand new mini-game types and a new soundtrack. 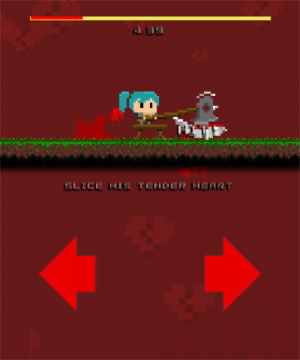 The story (if you can call it that) centres on an unnamed male character declaring his love to his female partner, who proceeds to shoot the fella down with an acidic response; this prompts a mini-game signifying their break-up. Each of the different game types has the same ultimate goal of breaking the poor guy's heart (quite literally) by smashing it to pieces in a variety of ways. Afterwards, a short cut-scene explains how the hero spent a few years getting over his heartbreak and you're introduced to his new girlfriend for the cycle to begin anew. (What this says about his choice of girlfriend is anyone's guess, but none want to stay with him). There's a pretty obvious-if-you-think-about-it end sequence connected to the final game type, but it's not much of a pay-off. From the beginning, there's a single game type accessible and a score target to hit which unlocks the second mini-game (and so on) until a total of fifteen different types are available. There's no pre-defined progression from game to game, once unlocked the player simply selects which to play from a list. Essentially, this means each game type is an isolated experience played on an individual basis. Only the fifteenth (and final) game will ever depict the ending sequence; the others are locked into the infinite story cycle of boy meets girl / break up / mini-game / meet new girl, continue. The games themselves are reaction tests - anyone who has ever played any of the WarioWare titles will feel right at home here. 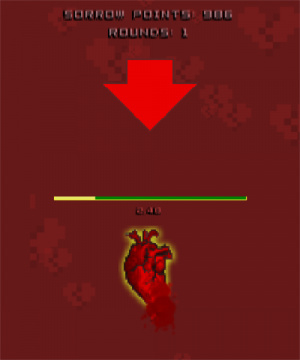 For example, the aptly named first game, 'Tap', sees the player frantically tapping a heart on the bottom touch screen to reduce an energy bar to zero. 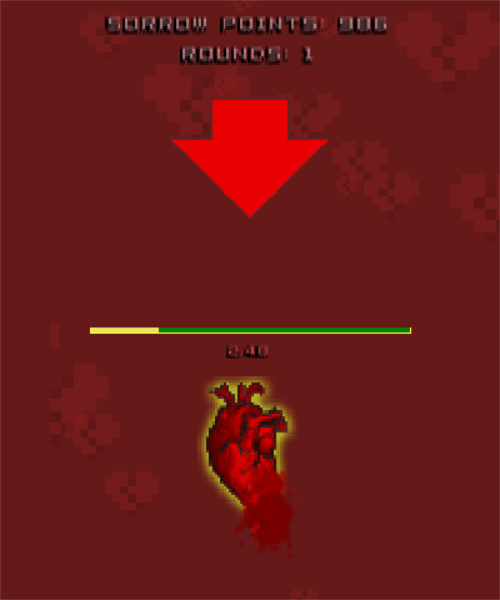 There's a strict time limit with each successful bashing moving the round on; a new heart appears and the energy bar grows. In basic terms, it's against-the-clock screen smashing, rising in difficulty until your fingers can't handle it any more, the time runs out or you break your 3DS. Thankfully, the second game type unlocked isn't quite the hardware-breaking experience of the first. A few of the game types are based on well-trodden classic game styles – there's a quick snippet of a side-scrolling shooter (shoot the heart), a top-down driving game (drive into the hearts) and a combo-input test (ending in a hadoken of the heart) amongst others. Unfortunately they are all a little too basic, so it doesn't take long to master and hit the maximum score targets (Gold) in each. Once you've seen all the game types and beaten all targets there's really little incentive to continue playing. It's actually a bit of a shame, as the retro-styled pixel art graphics are well drawn and provide an eerily surreal atmosphere to the proceedings – controlling a cute anime-esq pixel girl hacking up a heart with a giant axe is slightly disturbing, yet strangely alluring. What little dialogue there is between the characters is written with a decent degree of dark humour too, which further adds to the feeling of disappointment that there's a great idea within that's just waiting to be evolved. Even the 8-bit styled soundtrack starts off sounding retro-cool but gets old way too fast. Without any feeling of progression, the entire experience hangs-on the collective quality of the fifteen mini-games. Unfortunately they aren't quite good enough to hold interest and Heart Beaten is over way too soon. The WarioWare series succeeded through a combination of progressive story modes mixed with an absolute shed-load of mini-games to get lost in. With a paltry fifteen game types only, Heart Beaten suffers from a severe lack of variety. It's clear the throw-away smartphone sensibility of simple, two minute gaming lets it down slightly, and Heart Beaten comes across as a missed opportunity. A more fleshed-out sequel could fix these issues and make for a fun little package, because there is some fun to be had here, brief though it may be. Worth a look for die-hard mini-game score addicts, providing you're willing to repeat, repeat, repeat. For most though there won't be enough gameplay here to satisfy. In the case of Heart Beaten, less is definitely not more. ummm... does anyone care much about this? I agree with the review and score but love this game. If it sound like your kind of thing, get it. You won't be disappointed. @crzysortagamer they review every download game. No point in making an exception because few people may be interested. There is actually a fine line between dark humour/sarcasam on the one side and tastelessness on the other. This game is the latter I my eyes. @dereq To quote the proverbial classic rock ballad, "Love Stinks..."
@Barbiegurl777 I can only imagine (But I think pretty accurately) what would happen if somebody made a similar sort of thing called wife beaten. (Both are as tasteless but peoples reactions would be different). I watched the video and Hahaha, LoL ,. Stupidly Funny, Sorry I had to post that- they should have released this on Valentines Day . @unrandomsam You're right. I'm honestly surprised that this game even exists? Like, some games are kind of sexist but this is just ridiculously sexist in both directions. @C-Olimar There's always a point. @unrandomsam Of course it would be different. But you're not beating and hacking away at a wife in this game. It's a heart. 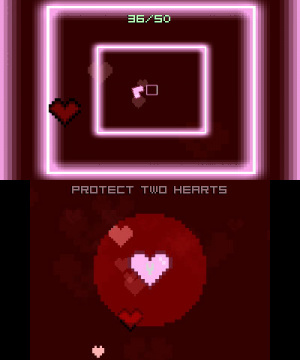 If the gameplay in this one had you beating and hacking away at another person, and they just called it "Heart Beaten", then you'd have a point. Side Note: Heart Broken seems like a better name for this, or even Heart Attack. @Windy I was just thinking that. That was a good game, but didn't hold my attention for that long.